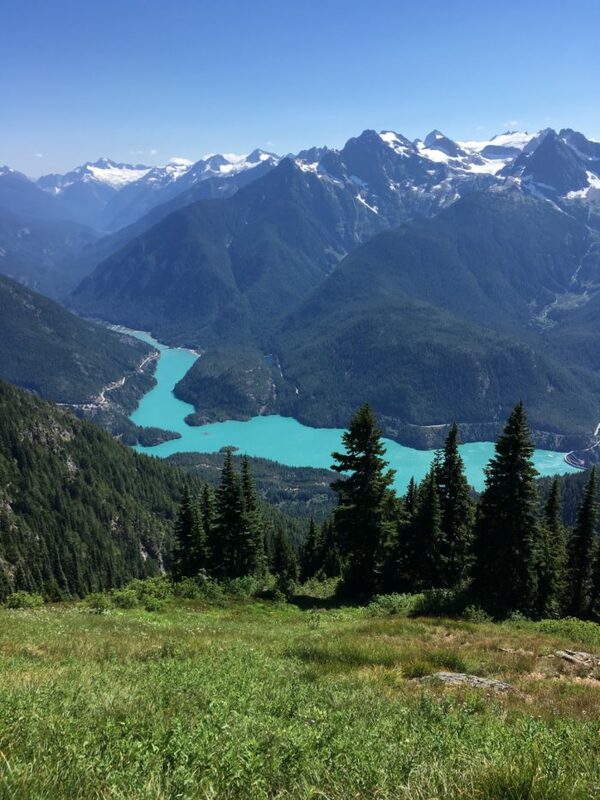 I spent weeks researching my first backpacking trip, a simple overnight in Washington’s State’s North Cascades National Park. My friend bailed on me last minute to go to some sorority mixer at Gonzaga University in Spokane. 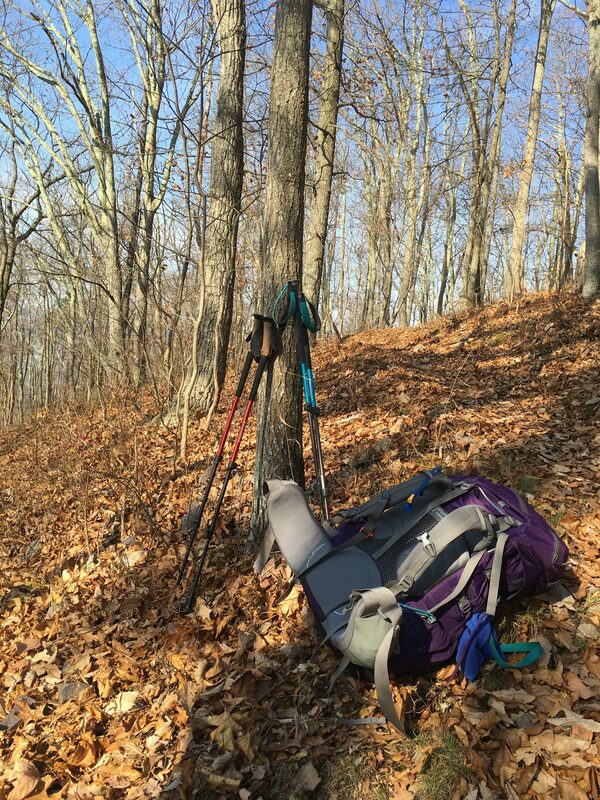 I had the gear ready, the maps, the route, I had spent weeks scouring trips reports to see if the early snow had melted, reading between the lines, comparing conditions in April for the past ten years. I had pinned down the best of the three park campsites to spend the night, all at increasing distances into the park’s interior. I was ready, and apprehensive, and I went without him anyway. I was terrified the entire time, looking over my shoulder for either a bear or a park ranger who could, with one glance, know that I was in over my head and didn’t belong in this place. I made plenty of mistakes but I did a few things right too. I had no idea at the time that my life changed forever. View from Sourdough Mountain overlooking Diablo Lake. North Cascade National Park, WA. I ended up taking a number of backpacking trips while stationed in Washington while in the Navy. It was a way to slow it down for a weekend, to decompresses, either from a deployment I just got home from, or one that was soon to come. I quickly began to love being outside, eating Mr. Goodbars and couscous with a can of turkey meat. Walking, with all my supplies on my back. It wasn’t always that way though. I first heard about the Appalachian Trail in grade school. Social studies, or geography, something about a footpath stretching over the famous eastern mountain ranges, a path interwoven with the history of this country. Later, on the radio, I heard of a woman attempting a fastest known time (FKT), and she described the hardships, the glory, the pointless ups and downs, and her support waiting at road crossings with supplies. To me, the lands east of the Great Plains were a boggy nothing crossed periodically by memories of American history and populated by Civil War reenactors. I grew up in Arizona, the Phoenix East Valley specifically, and I could look out toward the east to see the flat and foreboding wall of the Superstitions rise from the gravel and brush. These mountains were surrounded by a native mythology and folklore, and for much of my life this was a land that one fears to tread. So I thought the same of a mountain path from Georgia to Maine. That anyone would be willing to traverse first a set of mountains, then another beyond that, off into a land that was mysterious and remote, traveling along the Eastern Seaboard was equally preposterous and impossible. I remained a naysayer, especially considering myself to ever even begin to think of such an absurd and futile task. 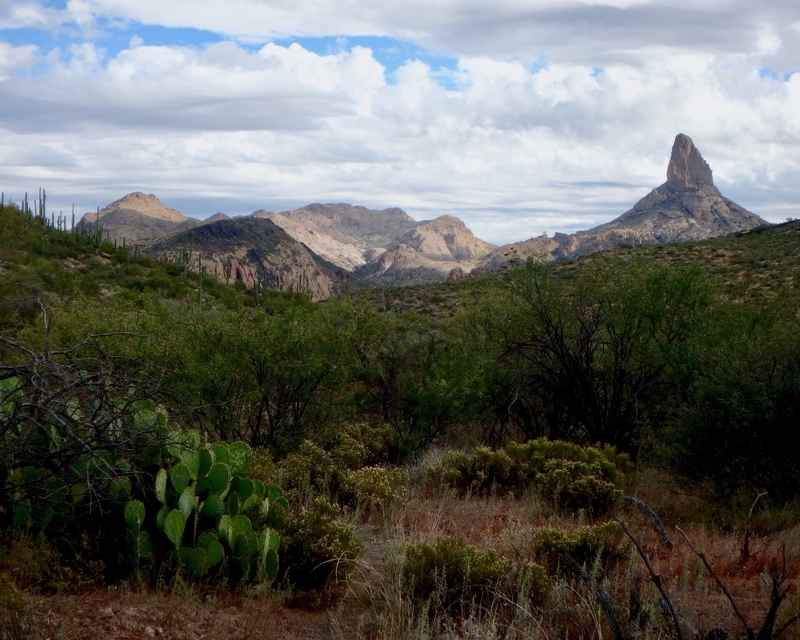 Weavers Needle in Superstition Wilderness, AZ. My first attraction to backpacking came through a bike trip. Not really even a bike trip, but rather the idea of a bike trip. I moved to Chicago at 18 to go to college and really be somebody. For someone who grew up in a suburban, auto-centric environment, the idea of cycling and pedestrianism was foreign and recreational. I didn’t see the pragmatic and practical aspects of self-supported travel. The bicycle, my own two feet, these gifts of transportation via the power within my own body would soon be uncaged. Passing through urban space on my own terms became desirable and it was the beginning of the awakening of my personal freedom. I bought a second-rate, aluminum-framed single speed bicycle that a man in a shop on Broadway literally pulled out from under a mountain of trashed and discarded bike components. I rode this bike everywhere for the next three years, despite the flat tires, the rain, the slipping on black ice in the center of an intersection in the Loop in February. The tubes were patched, the wheels rebuilt and trued, the bottom bracket growing creaky, the frame bent and threatening to disintegrate. Suddenly the city was open to me, anytime I wanted it, and in my own way. A friend had proposed we ride up to Milwaukee, about 100 miles along the lakefront. I hadn’t taken a trip of such distance, and was unsure if my bike, more importantly, if I would make it. Even in my causal dismal and excuse making, an idea was born. I could feasibly carry everything I needed, and through my own activity propel myself forward to the place I was aiming for. After that I could go beyond, then beyond that, on into forever. There are things we never think about because we don’t even know that they exist. There are options, there are alternatives to the lives we have been living up until the present moment, lives that are only beginning to take shape. 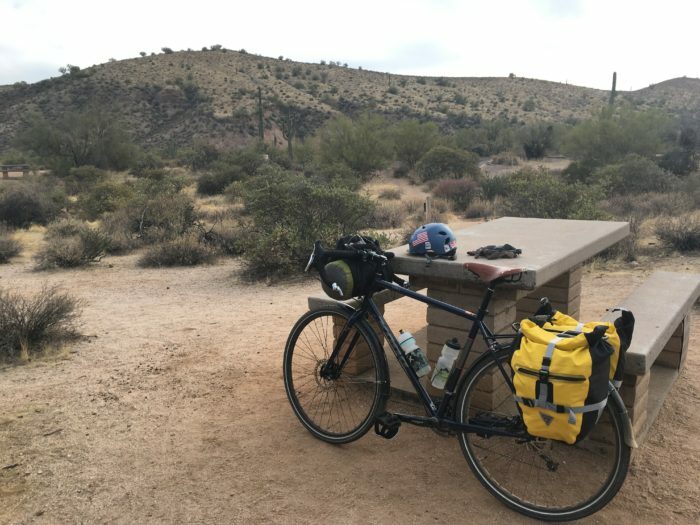 Bike overnight to McDowell Mountain Park, Fountain Hills, AZ. I moved to Pittsburgh, Penn., and had a chance to explore the beautiful region of Western Pennsylvania. I was sitting in a three-sided Adirondack style shelter in Raccoon Creek State Park wondering if I could take this weekender hobby and really go the distance. My partner and I loved to get out for a weekend. We cherished a day of hooky on Friday afternoon and took full advantage of a coveted three-day weekend. 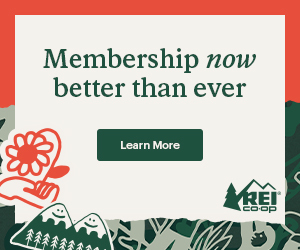 But we were looking for more. Could we hike a week, a month? Could we walk across the country? The obsession was born. Train Tracks through Ohiopyle State Park, Western PA.
dIt started with the Long Trail, America’s original footpath through the Green Mountains of Vermont. This would take us about four weeks through the summer and give us a good taste for what life on the trail might be like. Logistically we’d need to begin sometime in the summer, with me finishing school and her military discharge. The Long Trail inevitably led to that place, the AT. What was once impossible was now becoming a feasible option, a banquet of trail to satisfy the swelling appetite to go another mile, spend another night. 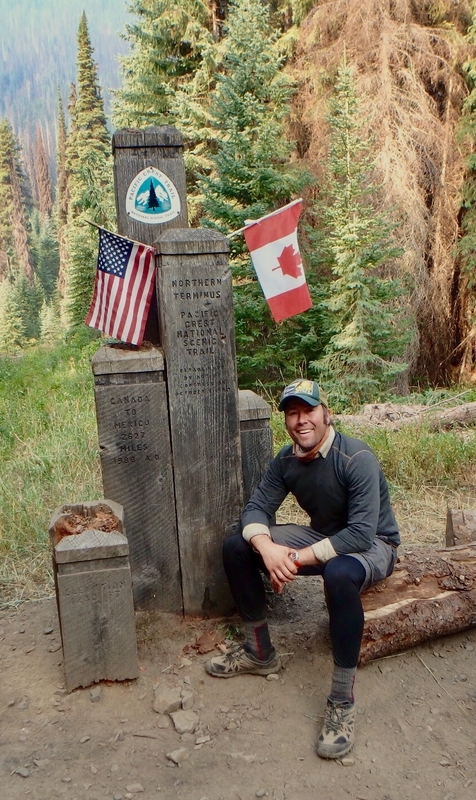 My partner had a friend who completed the Pacific Crest Trail in 2016 and I suggested she talk to him about all things long-distance hiking. Following that conversation, our collective sights once again turned west. After leaving Washington we both had a strong desire to see the interior of the Pacific Northwest, a land that had captivated us both. But the AT remained in the back of my mind, a loud whisper, an itch. Pack-drop in Shenandoah NP, VA.
Last summer I hiked the northern section of the PCT, from Burney Falls State Park in Northern California to Manning Park, B.C. During that hike I ran into many hikers who had completed the AT in previous years. To each of their stories and fond recollections, some were dismissive and others, like myself, attracted to the green tunnel. Those with whom I talked, our conversations only added to the growing conviction that I love long-distance, self-supported travel. Thus I will soon set foot on Springer Mountain, at the Southern Terminus of the AT. Northern Terminus Pacific Crest Trail, WA/BC.